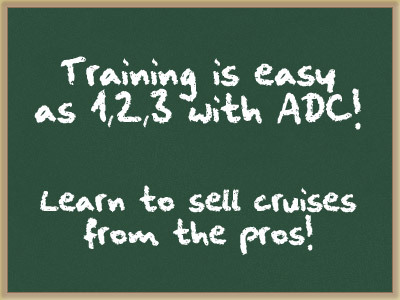 Our team offers a very in-depth "cruise school" training program that teaches each of our independent contractors all there is to know to start their own cruise (and land package) selling business from home. We give you the tools necessary to succeed. All you need to bring with you is the ambition and motivation to make your business a success! Our training courses are available year-round at our corporate headquarters, in New Jersey, over the phone or on the internet (via webinars). Please contact us for full details, or with any questions. Our course can be customized to fit your specific needs! This is just a brief description of our program. All of our courses are given by well-qualified travel industry experts with years of experience in selling cruises and land packages, as well as in training others to do so effectively. Please contact us for further details, such as the reasonable costs involved in obtaining training, by e-mail or phone (toll free 1-866-214-7447). Based on your experience level, our training program can be modified (should you require more or less).